I know you love to receive updates on the animals you find homes for, so here is an update on Osiris (also known as 'Gilbert'). He's a very special kitty cat and we love him dearly. He is such a love. Loves to cuddle (and be cuddled) ... loves to eat ... loves to sleep ... and generally loves to be with anyone who can give him special one-on-one attention. 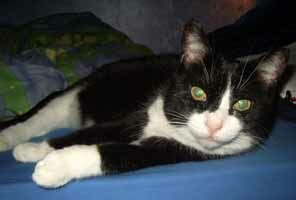 Osiris has settled into his new home very nicely and is a "happy cat". The family wanted to adopt another animal and we were thinking of a cat, but my daughter, Heather asked me if we could please adopt a dog, so we did. 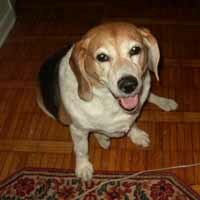 Approximately 6 weeks ago we went to the Toronto Humane Society and adopted a 9-year old female Beagle named "Sandy". She's absolutely lovely. Osiris wasn't too sure about her at first and he kept looking at me as if to say, "Is she going yet? 'Cause I'm not too happy about this! Why wasn't I consulted on this decision?" Well Osiris and Sandy have decided to accept each other and they "get along" (for the most part) with a mutual respect for each other's boundaries: Osiris' being, "The beds are mine." and Sandy's being, "The carpet is mine." (It's just a small area carpet she likes to sleep on.) It's so cute. Yes, it's quite the animal menagerie in this household and we're all very, VERY, happy together. I visit the Animal Welfare Association website quite regularly to see "Who is up for adoption" and "Who has been adopted" and it's wonderful to see what the AWA of Hamilton does for these lovely animals.